After their collision left Luke Shaw needing to be stretchered off with an oxygen mask after a heavy fall, Dani Carvajal was evidently affected by the incident. 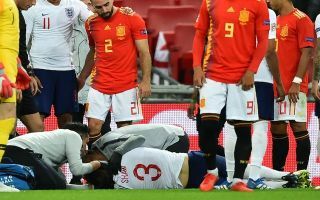 The England international sustained the knock during the defeat to Spain at Wembley on Saturday night, with concern raised immediately more so due to the impact with the ground after the challenge. While Carvajal looked concerned as the Man Utd ace continued to receive treatment on the field, Marca claim that he went to try and visit Shaw after the game but he wasn’t in the changing room as he was taken to hospital for further scans. In turn, he didn’t just accept defeat and leave it there, he reportedly asked David de Gea for his United teammate’s phone number in order for him to be able to get in contact and check on his well-being. It’s a classy move from Carvajal, one that is said to have been appreciated by Shaw, as ultimately there was no malice involved in it and it was an unfortunate injury for the left-back to suffer. After making such a positive start to the season for both club and country, he’ll hope that it doesn’t now lead to a spell on the sidelines. As for Carvajal, it’s great to see that kind of camaraderie even between opposing players, and he’ll certainly be relieved that Shaw has seemingly escaped a serious setback as the Man Utd star even took to Twitter on Saturday night to offer a positive update on his condition, as seen in the tweet below. Thank you for all the love and support I am doing fine and am in the best hands. I’m a fighter so I will be back soon! ?? ?